Post written by Beth Unger, School Programs Coordinator. 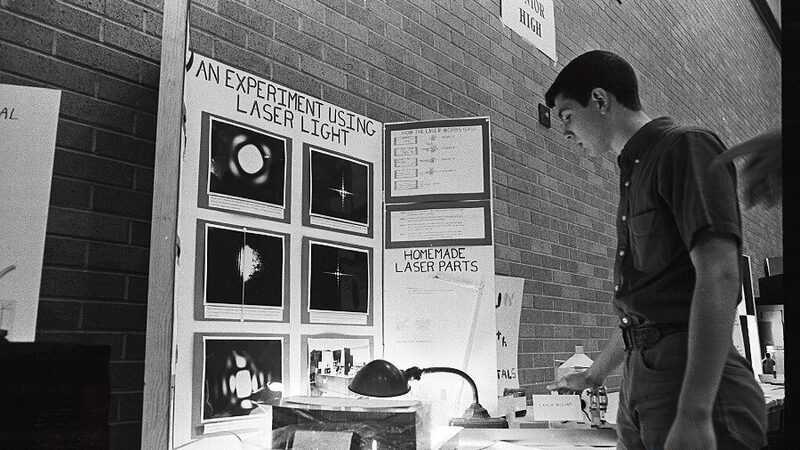 In April of 1994, the former Discovery Center Science Museum hosted the first Poudre R-1 Elementary School District Science Fair. From 1994 to 2009, the District Science Fair was hosted at the former museum. After the 2009 Science Fair, the Fair was relocated to local junior high schools (Boltz & Lesher) as Fort Collins Museum of Discovery began its transition to the new building where we are found today off Mason Court. The District Science Fair has continued to grow each year to include more students from more schools. Can we increase community engagement with the district fair by changing the location of the fair? 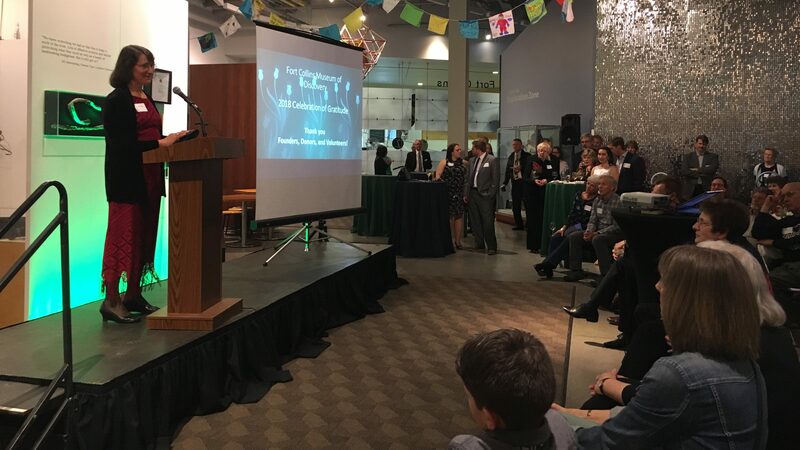 If we move the district fair to Fort Collins Museum of Discovery, the projects will be viewed by more community members and inspire scientific curiosity and innovation in our visitors. Fourth and Fifth grade students participate in their school science fairs. Those who receive top awards at their school fairs advance to the district science fair. Students bring their projects to FCMoD to display in the Learning Labs at the museum. Judges preview student projects and make preliminary evaluations. Judges conduct one-on-one interviews with the students to learn more about their project and methods. All judges compare their notes on student projects, re-visit the most creative and innovative projects and collectively nominate the projects to receive awards. Students, family and friends, as well as museum visitors are invited to the awards ceremony to celebrate the achievements of all the science fair participants and to see who takes home the “Best in Show” prize! Results/Conclusions: Come to the fair this year to find out for yourself! If you’re interested to see how this project (and all the student projects!) turn out, join us for this year’s District Science & Engineering Fair! Student projects will be open for public viewing on Saturday, March 30, from 1:30-2:30 pm followed by the Awards Ceremony. After the conclusion of the fair, the public is welcome to view the Science Fair projects between 10:00 am and 1:00 pm free of charge on Sunday, March 31, in the Learning Labs. Have you ever wanted to travel back in time? 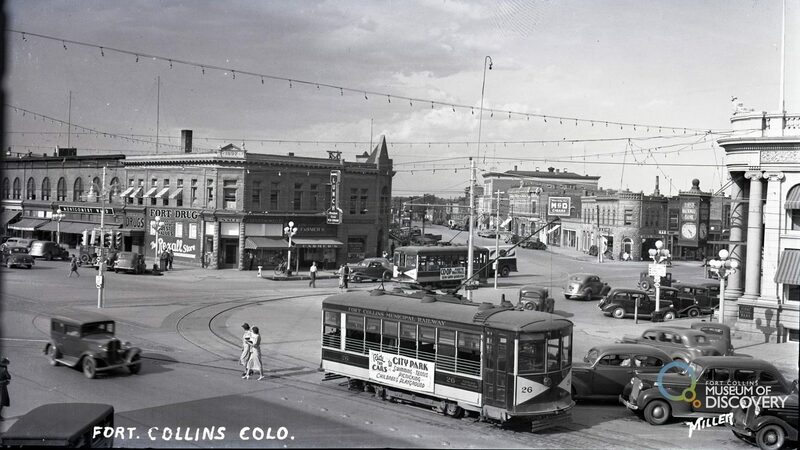 In our latest blog we travel back to the historic decades of Fort Collins. We will start in 1910 and travel up to 1980. Join us as we scavenge the local history of our town. The 1910s were turbulent for Fort Collins, as for the rest of the world. 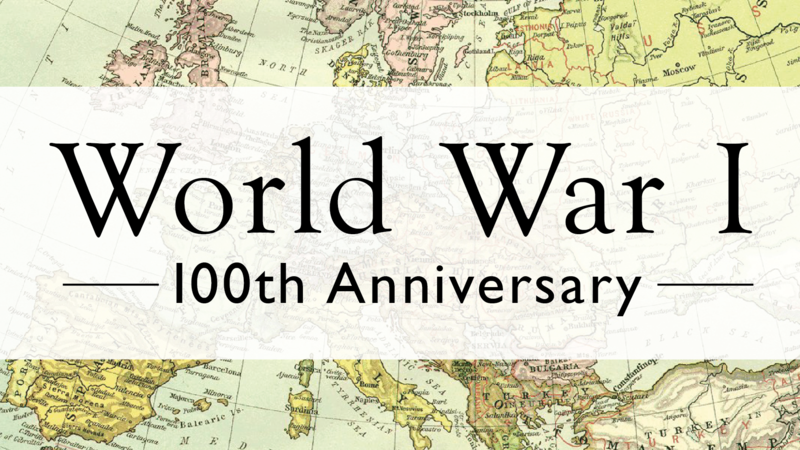 The first world war dominated the news of the latter half of the decade. However, there were also many important civic developments. Among these was the city’s change to a commission form of government in 1913. Also important to the town’s continued development was the sugar industry, which continued as the dominant economic force of the area. In September 1919, The Fort Collins Express noted that an estimated twenty million dollars had been paid for sugar beets in Larimer County in over a period of seventeen years. College students built and whitewashed the “Aggie A” on a hillside west of town in 1912. Three years later the school and the town celebrated the football team’s first conference championship. The Fort Collins Express expected the title to bring more students and prestige to the school and consequently benefit the town. Annually, the “Aggie A” is still painted by college students. Despite a generally depressed farm economy after World War I, Larimer County farmers were comparatively prosperous. The Fort Collins Express-Courier (the two local papers combined in 1920) claimed that no other county in Colorado fed as many sheep and cattle as did Larimer County. Beet growers were also still doing well. An attractive contract in 1925 between Great Western Sugar Company and the Mountain States Beet Growers Marketing Association guaranteed eight dollars per ton plus incentive bonuses. Larimer County was also prospering industrially. It ranked third among Colorado counties in manufacturing. Most of the factories were in or near Fort Collins. The biggest producers were the sugar factory and the Ideal Cement plant built in 1927 near La Porte. History contains the good, bad, and ugly – and the 1920s witnessed a resurgence of the Ku Klux Klan in Colorado. The Klan gained control of state politics during the early part of the decade and had many men in elective and appointive offices. Klansmen in Fort Collins could be found in courthouse offices and city hall. During one rally, sheet-covered KKK members marched from North College Avenue to Lincoln Park. However, the Klan did not place a significant number of its people into local public offices. Its influence faded during the latter half of the decade. A political figure on the rise, Franklin D. Roosevelt, visited Fort Collins in 1920 on a campaign tour as a vice-presidential candidate, and spoke from the courthouse steps against increasing the Navy and for the League of Nations. The Great Depression of the 1930s worsened an already dismal situation. A farm economy which had been depressed since the end of World War I sank even lower as prices fell to new lows for agricultural commodities. Drought during the first half of the decade, combined with a grasshopper plague, added to the hardships, especially for plains farmers, many of whose crops were lost. In the Fort Collins area, the water shortage became so severe that the city banned the use of water from the waterworks system for lawns and gardens in September 1934. The Cache la Poudre River was said to be at the lowest level known since settlement of the valley. In March 1935, the city council approved a watering rule which allowed townspeople to water their lawns one day per week. The Extension Service of Colorado Agricultural College played a vital role in providing relief to afflicted farmers. Extension personnel helped to gather and distribute food, protect crops from grasshoppers, and promoted tree cultivation. The Extension Service also participated in the development of several New Deal programs. The College’s Experiment Station also worked to alleviate the effects of the drought and grasshoppers and conducted other beneficial projects. The war in Europe, which began in 1939, had almost immediate effects in Fort Collins.In October 1940, 3,881 Larimer County men registered for Selective Service. A national draft was held at the end of the month. Battery A, of the 168th Field Artillery and Medical Detachment, was inducted into the U. S. Army in February 1941. Because of Colorado State College’s tradition of supplying military instruction, an R. O. T. C. program, and pilot training, its former students contributed heavily to the war effort. More than eighty former C. S. C. students died in the war. The College’s faculty also took part. Over one-third of the male teaching and research staff served in the armed forces or as advisers to the military. Several members of the faculty aided in weapons research, including work on the atom bomb. The College’s Extension Service and Experiment Station worked to maximize food production. Fort Collins women took part in defense training classes which taught skills needed for war industries. Although excluded from foundry work, women were included in classes for welding, machine shop and sheet metal work. To discover more about the decades and history of Fort Collins check out Fort Collins History Connection, the online collaboration between FCMoD and the Poudre River Public Library District: history.fcgov.com. Post written by Jenny Hannifin, Archive Research Assistant, and Doug Ernest, Archive Volunteer. Join us on Thursday, November 8th, for World War I and Fort Collins: Exploring the John Hurdle Scrapbook in the OtterBox Digital Dome Theater to commemorate the “War to End All Wars” through the local lens of a remarkable scrapbook created by John Hurdle, a Fort Collins man who traveled to Europe and served on the Western Front with Artillery Battery A during The Great War. On November 11, 1918, an armistice with Germany was signed in a railroad carriage at Compiègne. The ceasefire went into effect at 11am, and for the soldiers of Battery A, the war was effectively over. The fighting may have been over, but it would be many more months before the soldiers of Battery A returned home to Fort Collins. Soldiers of the 66th Field Artillery Brigade (which included Battery A) were part of the occupation force in Germany. They spent a few weeks in Blercourt; on Thanksgiving were served a huge traditional dinner; on December 2 departed for Germany; and celebrated Christmas Day in Germany by opening six kegs of beer. They remained in the town of Hohr-Grenzhausen, near Koblenz, until late May 1919. Stories in Fort Collins newspapers in 1918 and 1919 reported the deaths of three men of Battery A. Charles Conrey was killed in action on October 10, 1918. Jesse Martin and Frank Niemeyer died of pneumonia while the unit was still in Europe. In addition to these three, John Hurdle’s album lists four other casualties: Louis H. Pinkham, Charles C. Moore, James Orendorf, and Walter G. Ridgeway. Battery A soldiers left Germany for France on May 26, 1919; departed France on June 3; and arrived in New York City on June 15. At Camp Mills, on June 19, their regiment was disbanded. Batteries A, B, C, D, and E arrived at Colorado Springs on June 24 via train, and “the Regiment marched in parade amid the shouts and praises of the entire populace.” From there the soldiers went on to Denver, Fort Collins, and Cheyenne, where they received similar welcomes “and the appreciation from the citizens of our record on the fields of France.” By the end of June the batteries had been discharged from military service. 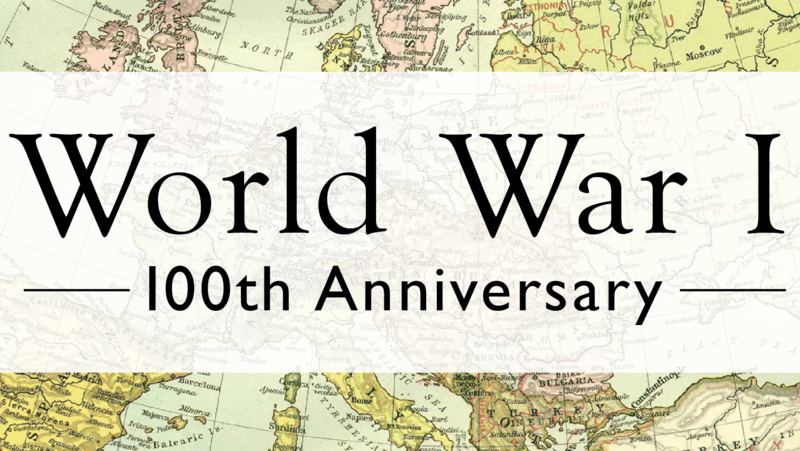 To learn more about what happened to our Fort Collins soldiers AFTER World War, check out the resources below. And visit the Archive! “Glad Peace Tidings Bring Joy Untold To Fort Collins – Entire City Is One Mass Of Flags Joy Hilarity And Song” : A report of the World War I armistice celebrations in Fort Collins and Loveland, Colorado on Nov. 12, 1918. Fort Collins Museum of Discovery had the honor of interviewing local author, Barbara Fleming. Barbara, a Colorado native, was interested in history and reading historical novels at a young age. When she went to college at Colorado State University, she studied English and writing. Barbara then ventured out to work as a journalist, teacher, and finally found herself writing books of her own in the 1980s. Barbara sat down with staff for an interview in honor of National Authors Day on November 1st. The following interview has been edited for length and clarity. Tell us a little bit about yourself and your connection to FCMoD? I am a native of Fort Collins. I have always been a lover of history. When I retired, and we moved back to Fort Collins, my late husband and I, I started writing the historical column for the now Fort Collins Weekly which became Fort Collins Now, in the meantime I had been contacted by a company called Arcadia publishing about writing historical books. So, I got together with a friend of mine, Mac McNeill, and we put together Fort Collins: The Miller Photographs and in the course of writing that I got even more interested in the history of my hometown because it is rich and fascinating. So, when the Weekly went out of business, I contacted the Coloradoan and started writing the column for them. Doing that brought me to the Archive multiple times before and after it was moved to the Fort Collins Museum of Discovery (FCMoD). I was well acquainted with [the archivists] back in the basement of the Carnegie building, where the Archive used to be, and am still now acquainted with the archivists at FCMoD. So, I have been coming to the Archive for a very long time. I was always a writer. I started writing, almost, well actually before I started school and I taught myself to read when I was four years old. When I was young I was going to be like Jo March from little women – I was going to be sitting in a garret and eating apples and writing famous books. Didn’t quite work out that way, I had to earn a living, so instead I started teaching English. 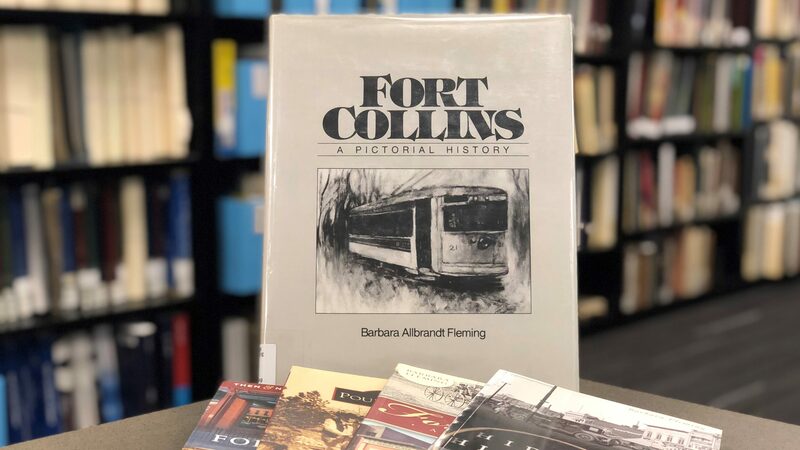 I did write a book in 1983, which is called, Fort Collins a Pictorial History, which is a hard-back book that is now out of print. And subsequently I wrote from time to time about various topics for various publications. It was not until I came back here that I started to devote more time. I went to college at CSU. My late husband Tom and I lived in Denver for a time and I taught at various community colleges as an adjunct English teacher. But I was always a writer. How did the process of writing your first book, Journeying, go? Journeying was the first book I published without a co-author. Then I published a couple more: Legendary Locals of Fort Collins, Fort Collins A History, and Hidden History of Fort Collins. The process included a lot of research, and a lot of pondering. But when I write a novel – and I have written several, even though only two have been published – I just wait for the characters to find out what they are going to do, that’s hard to describe if you’re not a writer, but writers understand that. Journeying is historical fiction. The others I have written are more contemporary, but who knows if they will ever see the light of day, it’s hard to say. Now that you’ve been published, is there anything you wish you would have known before? I think any writer can look at anything he or she has published and would like to do it all over again. We can see the flaws even if other people can’t. But, no, when your writing you reach a point that I quit that’s it and enough is enough and you let it go because you have to. So, no there is not anything that I wish I would have known before. 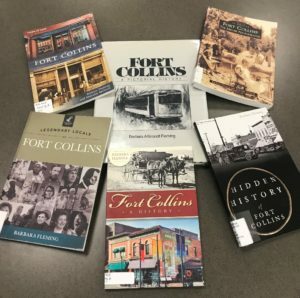 What are some books you would recommend for locals to learn about Fort Collins history? History of Larimer County Colorado by Ansel Watrous – it’s not a book you sit down and read, but a book you can take in bits and pieces of. And a book that ought to be in any serious historian’s library. And Fort Collins Yesterdays by Evadene Swanson as well as and John Gray’s book The Story of Camp and Fort Collins: Calvary and Coaches, which I would love to own (but if I got it through ebay or somewhere it would cost me almost $300 so I can’t do that). The Wrecking Ball of Progress by Wayne Sundberg is a good video to understand about historic preservation. The museum has done a video about the history of Fort Collins and that’s a good one too. I don’t listen to podcasts so can’t recommend one. There is a digital newspaper state collection online, Colorado historic newspapers, which goes from beginning of newspapers of the 1860s to 1924, that they have all been digitized. What role would you like to see museums like FCMoD play in helping prepare young people for a career in STEAM related fields? Anything that can get them engaged is of value. Young people are – well I can’t make generalizations – I feel young people can be somewhat disaffected, and not as involved with the world around them as we – or I – would like them to be. Anything a museum, or anyplace really, does that reaches young people and encourages them to be engaged and hands-on is of value. The arts are critical to the survival of a culture. We need art. FCMoD’s archive has multiple of your books in our collections. How does it feel to have your story preserved in a museum? I think it’s very gratifying. I think the more information we can share about history the better. To me, history is not just dates and events – and that’s the way it is usually taught. And so, a lot of people say they hate history and say it is boring. History is people and their stories. And so, I don’t record history. I tell stories. And there is a huge difference between the two. So, I am pleased if my stories are there for future generations. What do you wish people would ask you about writing? Hmm… I think rather than having people ask me about writing, because it is such an individual task, I would like to be able to encourage people to write, whether they think they are good writers or not, because everyone has stories to tell and we ought to share our stories. So even if you do nothing more as an older person than write out significant events in your life, you are telling a story and that is what is important. I would love to think that such ideas and information are being shared by younger generations. One of the things I do is through the Partnership for Age- Friendly Communities- a formal nonprofit organization. They publish a blog once a month called Graceful Aging that is written by older people whose stories are told about their experiences of aging. Our goal is to reach young people to help them understand what it feels like to be old and what kind of experiences we had and what we share; to touch them in some way. Here at FCMoD, we tell the stories of Northern Colorado. Part of the museum’s vision is to inspire inquisitive thinkers. What advice do you have for the future journalists, writers, authors and dreamers of the world? Well for writers, first of all, write about what you know, write from your own life and experience and it will expand as you begin to write to the world around you. For dreamers, I think anything is possible, the world is changing so rapidly, so intensely, that we sometimes, I feel that I am on a merry-go-round, going around and around, faster than I can keep up with. I think you just have to grab the brass ring and believe anything is possible… because look how far we’ve come. In my lifetime, it’s astounding, we have gone from communication by telephone – when I was growing up we had a party line – to this; to the internet. It is astounding what has happened, even in the last twenty years. I think it is because people keep dreaming, and I think people need to keep dreaming. Writers should know though that making a living writing is tough, really tough. I couldn’t live on my writing. I travel on it, but I couldn’t live on it. Unless you’re really lucky or if you’re JK Rowling or James Patterson, you’re not going to make a living. But that should not deter them from writing because there are always stories to share. And I think we do not share enough. Thank you to Barbara for her time and for sharing her stories! Barbara will also be at a book signing December 1st at JAX Outdoor for their annual author day celebration. Guest post written by Poudre River Public Library District, with thanks to Johanna & Ludy. Since then, the festivity has been celebrated all over the world and centers on honoring, remembering, and celebrating the lives of those who have departed. 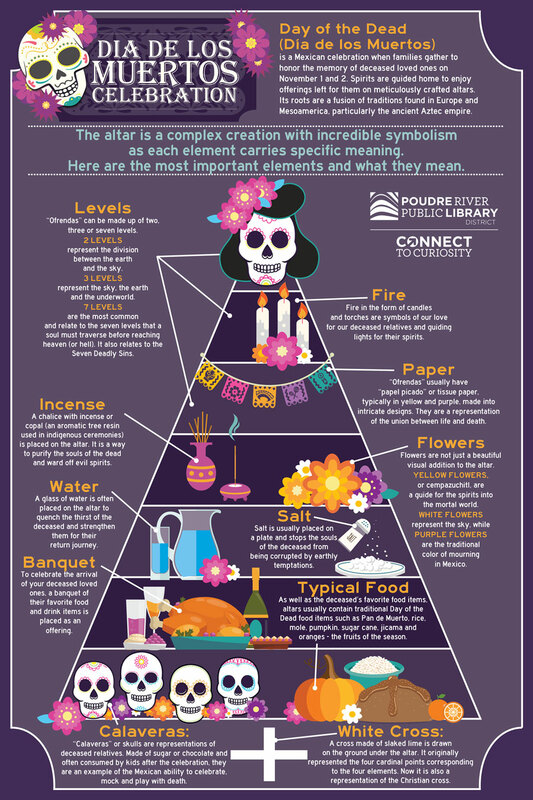 Our community, organizations, and agencies have celebrated Día de los Muertos for over a decade with the Poudre River Public Library District. We are very intentional in the creation of a program that decenters power of European ideologies in this event. This year the celebration of family and remembrance takes center stage at the Día de los Muertos Celebration at Northside Aztlan Community Center (112 E. Willow St.) on Friday, November 2 from 5:00 – 6:30PM. The entire community is invited to celebrate the Day of the Dead and learn about this traditional Mexican holiday. 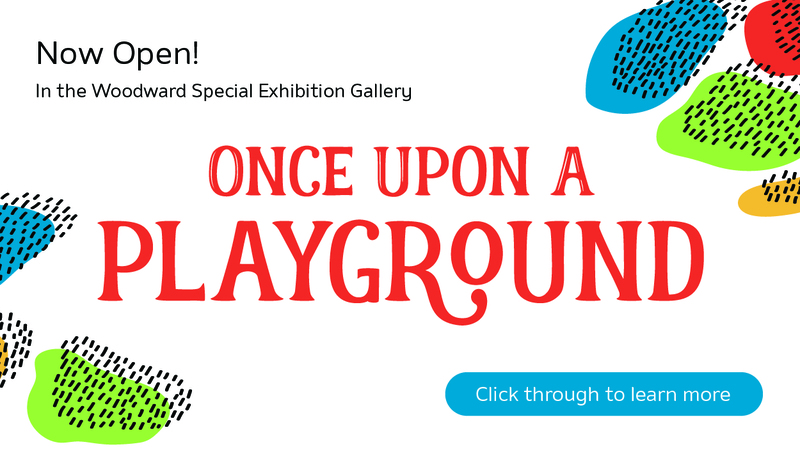 This year’s event includes family-friendly activities, bilingual storytime, sugar skull decoration, altars, live music and dance, and Mexican food sampling. One of the most visual parts of the Día de los Muertos tradition is the altar, a carefully crafted centerpiece of the annual celebration. 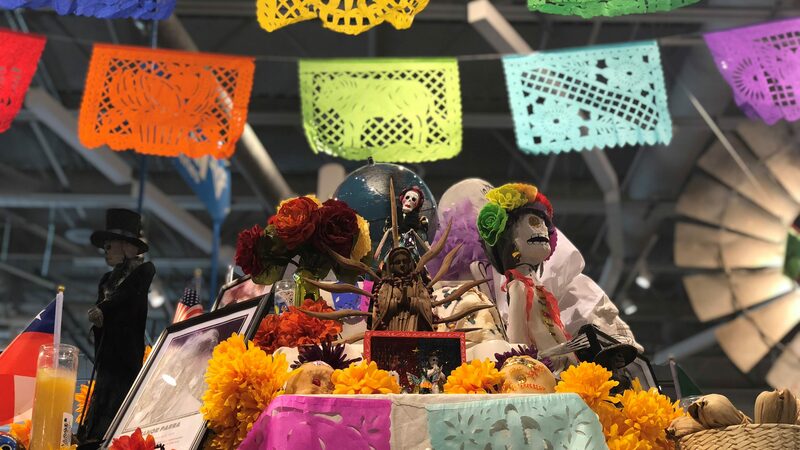 For this year’s celebration, a specially crafted altar, designed and created by Ludy Rueda representing the Library District, will be on display at the Fort Collins Museum of Discovery (408 Mason Ct.) from October 24 – November 4. Each family or individual’s Día de los Muertos altar is a complex and personal creation with incredible symbolism as each element included carries specific meaning. Here are the most important elements, from flowers to food to fire, and what they mean. The free Día de los Muertos community celebration is presented by Poudre River Public Library District, City of Fort Collins Parks and Recreation, The Family Center La Familia, and Fort Collins Museum of Discovery. El día de los muertos es una celebración Mexicana donde cada año las familias se reúnen para honrar a sus ancestros y seres queridos del 31 de octubre al 2 de noviembre. El origen de esta celebración data cientos de años atrás cuando nativos Aztecas celebraban rituales durante el verano dedicados a la muerte. Después de la colonización, las fechas de las festividades se cambiaron para coincidir con creencias post-colombinas como “la noche de todos los santos”. Desde entonces, esta celebración ha sido acogida en diferentes partes del mundo y se centra en honrar, recordar y celebrar la vida de aquellos que ya han partido. Nuestra comunidad, diferentes organizaciones y agencias, han celebrado con el distrito bibliotecario esta hermosa tradición por más de una década. En este evento en particular, el distrito bibliotecario ha creado un programa que, de forma intencional, descentraliza el poder de ideologías Eurocéntricas. Este año la celebración familiar será en el Centro Comunitario Northside Atzlan (112 E. Willow St.) el viernes 2 de noviembre de 5:00 a 6:30 PM. Invitamos cordialmente a la comunidad a celebrar esta hermosa tradición mexicana. El evento incluirá actividades para toda la familia: hora del cuento bilingüe, decoración de calaveras de azúcar, ofrendas, danza, mariachi y comida mexicana. Es importante señalar que cada familia o individuo crea una ofrenda que es personal, compleja y que utiliza detalles y elementos que tienen un gran significado. En la siguiente imagen encontrará un breve resumen de algunos de estos elementos y sus significados. Post written by Alexa Leinaweaver, Live Animal Husbandry Coordinator. What makes a reptile a reptile? Reptiles are vertebrates with scaly, with dry, water-proof skin. They generally lay eggs with leathery shells, unlike the hard-shelled eggs of birds. Reptiles are poikilothermic, generally termed as “cold blooded,” which means they maintain their body temperature through external sources of heat such as basking in the sun. Reptiles that live in northern latitudes – such as those native to Colorado – will become dormant in winter: their bodily processes slow in the cold. There are four orders of animal that make up the class Reptilia: Testudines (turtles), Squamata (lizards and snakes), Crocodylia (crocodiles and alligators), and Rhynchocephalia (tuataras). Turtles and crocodiles first appeared on earth along with the dinosaurs! Reptiles live on all continents except Antarctica. 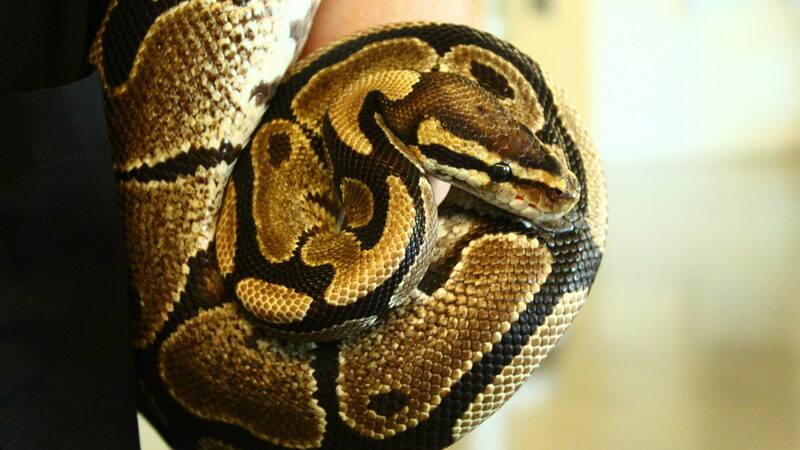 Our Ball Python, named Slinky, is approximately 20 years old. The oldest Ball Python on record lived to be 40 years! The species is native to sub-Saharan Africa. Ball Pythons often burrow underground to stay cool in the African heat. They also may cool themselves in pools of water. This python is named “ball” because when threatened, it curls into a ball for protection, hiding its head and neck (the most vulnerable parts) in the middle of the ball. Ball Pythons are also called “Royal Pythons,” as there is a story that royalty in Africa would wear the snakes as jewelry, because the camouflage pattern on their scales is so beautiful. 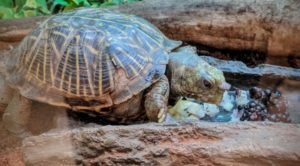 Our Ornate Box Turtle, Tara, is a species native to Colorado and the Great Plains. She eats fruit and vegetables – she loves pear the most! – and insects. Turtles don’t have teeth, but instead a sharp beak that they can use to crunch through an insect’s exoskeleton or bite into a tough root. Turtles have a shell that protects them from predators, made from keratin (the same thing our fingernails and hair is made from!). It is attached inside to their spine and ribs. Tara and other turtles (though not tortoises) are able to pull their legs and head completely inside the shell when threatened. In a cold Colorado winter, Ornate Box Turtles will dig a hole in the ground and hibernate to survive. 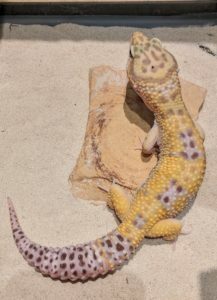 Our two Leopard Geckos are native to Iran, Afghanistan, Pakistan, and parts of northern India, where it is dry and rocky. It can get very hot there during the day, so they generally stay in the shade or in burrows while the sun is out. They are active at dawn and dusk when the temperature is more comfortable. As winter in that area can get quite cold, these geckos will stay underground the entire time and hibernate. Leopard Geckos will hunt for insects, spiders and scorpions, as well as other lizards. A fascinating fact about them is that they are immune to scorpion stings! These reptiles keep their food reserve in their tails, which is why the tail looks so large compared with other lizards. When they are threatened by a predator, they can even drop their tail completely! The predator will be distracted by the tail while the gecko gets away. The tail eventually grows back. Geckos use their tongues to clean their eyes. They will also use their tongues to figure out what is in the environment around them. 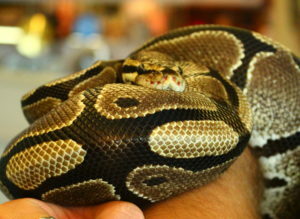 How you can celebrate Reptile Awareness Day! Take some time to learn about reptiles! There are some amazing species out there, and the more we know about them the better humans and reptiles can live together. Visit FCMoD and observe our reptiles in our Animal Encounters exhibit! Observing a reptile will help you understand and appreciate these amazing creatures. Post written by staff members at Fort Collins Museum of Discovery. Did you know October is American Archives Month? American Archives Month is a nationwide event that presents an opportunity to communicate to people that historical materials important to them are being properly preserved, cataloged, cared for, and made accessible by trained archivists, archives assistants, interns, and volunteers. On October 16th, the Curator of the Archive at Fort Collins Museum of Discovery (FCMoD), Lesley Struc, will attend the Fort Collins City Council Meeting for a special proclamation. Mayor Wade Troxell will proclaim October 2018 to be American Archives Month in the City of Fort Collins! 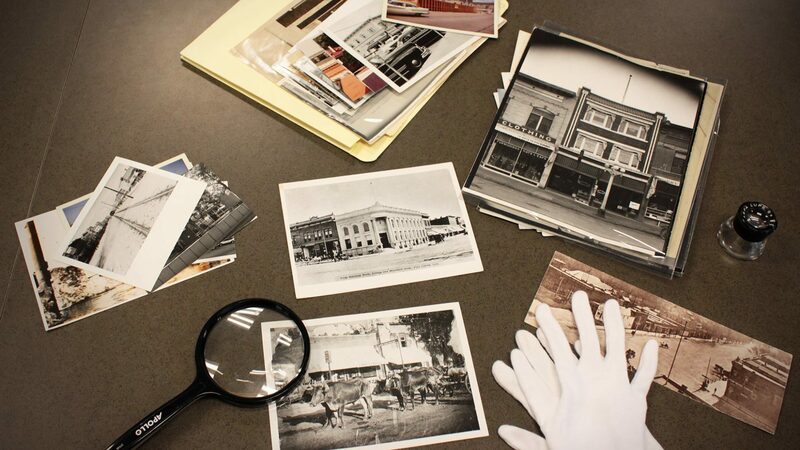 At Fort Collins Museum of Discovery, the Archive serves as a free and open resource for people of all ages to learn about the local history of their families, homes, and communities, so we can understand and strengthen our collective memory and reflect on our shared past. The Archive fosters discovery. Whether you are writing a research paper on local history, are interested in seeing what Old Town looked like 100 years ago, or are viewing local high school yearbooks – the Archive at FCMoD is the place to study firsthand facts, data, and evidence from letters, diaries, reports, scrapbooks, rare books, maps, newspapers, oral histories, and many other primary sources that elucidate the story of Fort Collins. No appointment is necessary to visit the Archive (open Tuesday through Saturday from 10:00 am to 12:00 pm, and 1:00 pm to 5:00 pm), but if you have specific questions, contact the Archive staff or Curator of the Archive prior to your visit so we can better assist you. 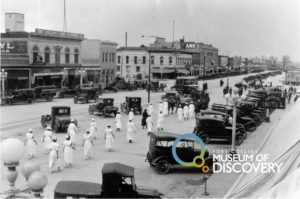 Access to many resources from the Archive’s collection is also available through the Fort Collins History Connection website (history.fcgov.com), an online collaboration between the Poudre River Public Library District and FCMoD. Celebrate American Archives Month by visiting the Archive at FCMoD today. What will you discover? For more information visit fcmod.org/research. We have a new exhibit up in the Animal Encounters zone: Millipedes! The name “millipede” comes from Latin and means “thousand feet”. Millipedes have two pairs of legs for each body segment and usually more than 20 segments – which is a lot of legs! – but no millipede has actually been found that has 1,000 feet. 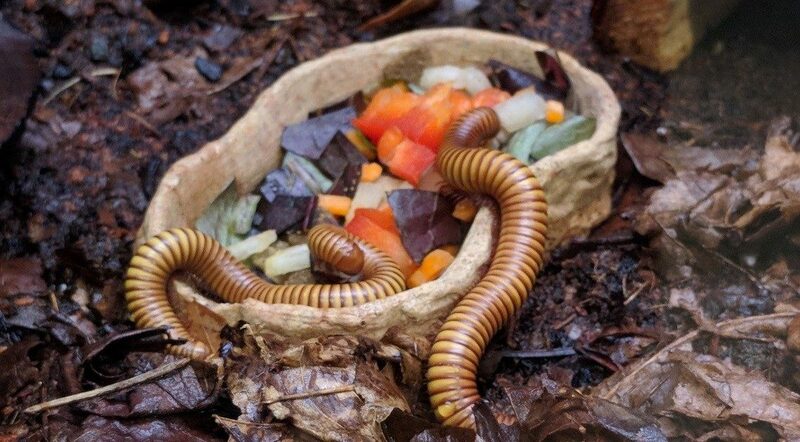 Millipedes eat vegetables, fruit, decomposing plants, and will even eat poop from other animals. They are the cleaning crew for the animal world! These arthropods will curl up into a spiral or coil when they feel threatened. They can also burrow underground to find protection from predators, as well as food and cool temperatures. The Florida Ivory millipede is native to the American Southeast (Florida, Georgia, Alabama). They are smaller and black-and-white striped. 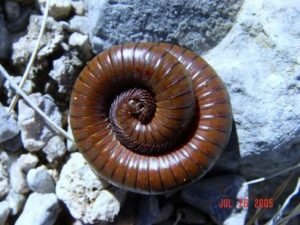 The American Desert Millipede is native to the deserts in the American Southwest. This species comes in several colors, depending on where they live and what colors keep them camouflaged and safe. The dark red-brown millipedes in the tank are also called Sonoran Millipedes, as that color tends to be found in Arizona, in the Sonoran Desert. The brown and gold millipedes are also known as Texas Gold Millipedes, as they are found in – you guessed it – Texas. Come see FCMoD’s millipedes during our open hours and stop by for our monthly series, Meet the Animals! During four months in combat in World War I, Battery A took part in three major battles: the Second Battle of the Marne (July 15–August 6), the Battle of St. Mihiel (September 12–16), and the Battle of the Meuse-Argonne (September 26–November 11). The Meuse-Argonne remains the largest battle ever fought in American history, with 1.2 million American troops involved and a casualty roll of approximately 122,000 dead and wounded. It is no exaggeration to say that the Fort Collins soldiers of Battery A had a significant role in World War I. At the Second Battle of the Marne (also known as the Aisne-Marne Offensive) Battery A saw their first dead and wounded soldiers from both sides of the conflict, witnessed enemy aircraft circle overhead, and suffered deadly gas exposure. In his history of Battery A’s Grande Puissance Filloux artillery piece, aka “Gila Monster,” Hurdle tells us that at the start of the German offensive, the GPF was in action for 72 hours. The barrel grew so hot that it could have fried steak and eggs and at times had to be filled with water to cool it. The troops’ efforts in July and August of 1918 would significantly impact the future of the war. Whereas in the spring and early summer of 1918 the Germans had been on the attack, hoping to defeat the French and British before American troops arrived, the Second Battle of the Marne reversed that situation. From August 1918 until the end of the war, the Germans were on the defensive, and the Allies always moving forward. An anonymous letter from a member of Battery A to the Rocky Mountain Collegian reported: “We counter-attacked right in the center of [the German] push, men met men, and after the hell stopped we held the River Marne’s south bank, and Paris, if not the world, was saved.” (“Battery A Actively Engaged in Fiercest of American Drives,” Rocky Mountain Collegian, January 2, 1919). Unfortunately, that deadly gas could spread almost instantaneously, and Hurdle was caught by it on August 10, near the village of Chery-Chartreuve. Though in serious condition due to gas exposure, he refused to be evacuated. 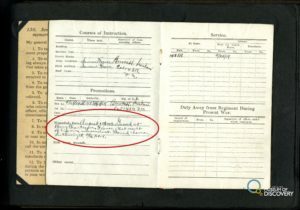 His military Record Book shows him as having participated in battles until August 16, 1918, but not thereafter. It seems likely that the Army sent him to a rear area not just for further officer training (he had been promoted from corporal to sergeant in the summer of 1918), but also to allow him time to recuperate from the lingering effects of that terrible gas exposure. 1987: Dee turned to the yellow pages, calling about six different museums to ask about what it takes to create a museum from the ground up. 1988: The ball began rolling and did not stop! Dee attended the Boston Children’s Museum seminar in April and then, in October of 1988, Dee and 15-20 people came together to begin the process of opening a museum in Fort Collins. 1989: In March of 1989, with the help of $50 donations from committee members recruited by Dee, the Northern Colorado Children’s Museum became incorporated. In the same year, it was officially renamed the Discovery Science Center. It took 2.5 years to go from concept to launch. The Discover Science Center was located in the old Barton Elementary School off of Prospect Rd. 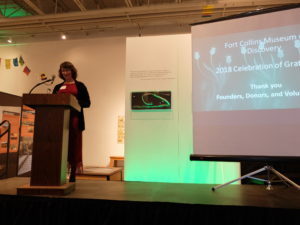 When discussion began of merging the Discovery Science Center with the Fort Collins Museum in 2008, the Discovery Science Center temporarily relocated into the Fort Collins Museum’s building, then located in Library Park. After that, as they say, the rest is history. 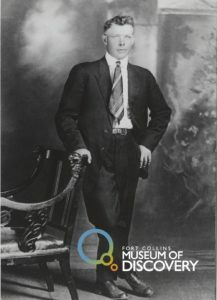 The two organizations then became what the museum is now: the Fort Collins Museum of Discovery. Dee giving her remarks and being honored at Celebration of Gratitude, April 23rd, 2018. Thank you, Dee, for your time, talent, energy and passion. We wouldn’t be here without you. The museum relies on the generosity of you – our community – to do everything we do. Please consider donating to support explorations in science and culture for all.